This is not a post about a military watch. 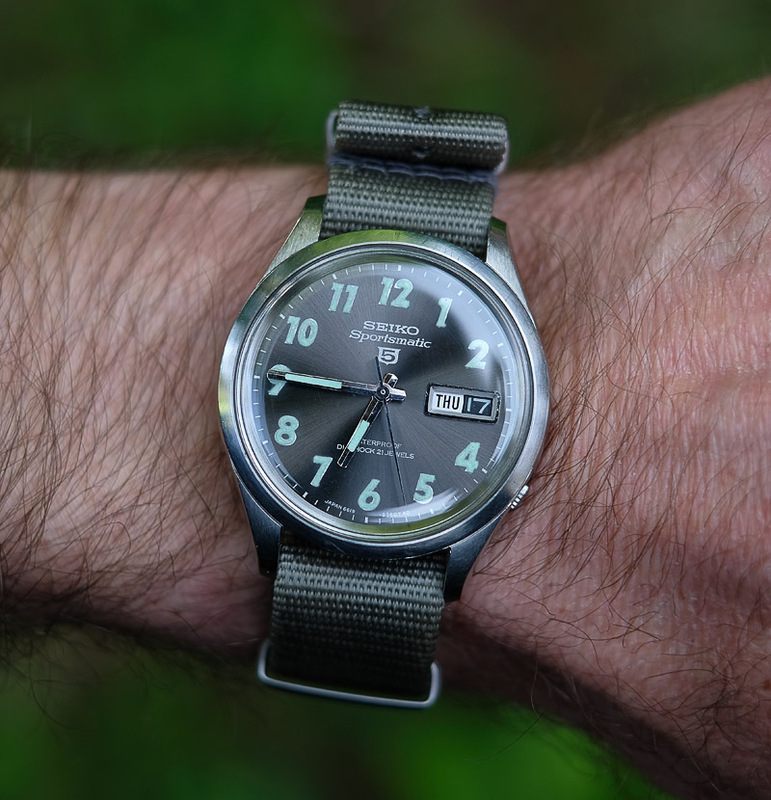 This is a post about a watch that skirts around the periphery of circumstantial associations of military-inspired Seiko 5’s with the Military Assistant Command in Vietnam in the 1960’s. 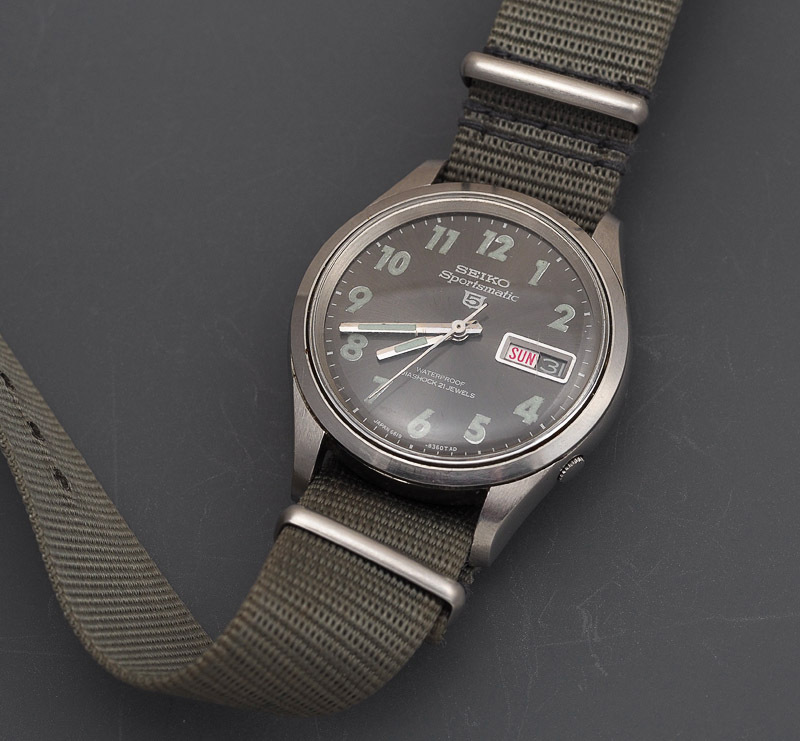 There is a certain amount of pretty convincing evidence that the Counterinsurgency Support Office based in Okinawa at that time supplied ‘sterile’ Seiko 5 watches to special operations units conducting covert operations during the Vietnam War. 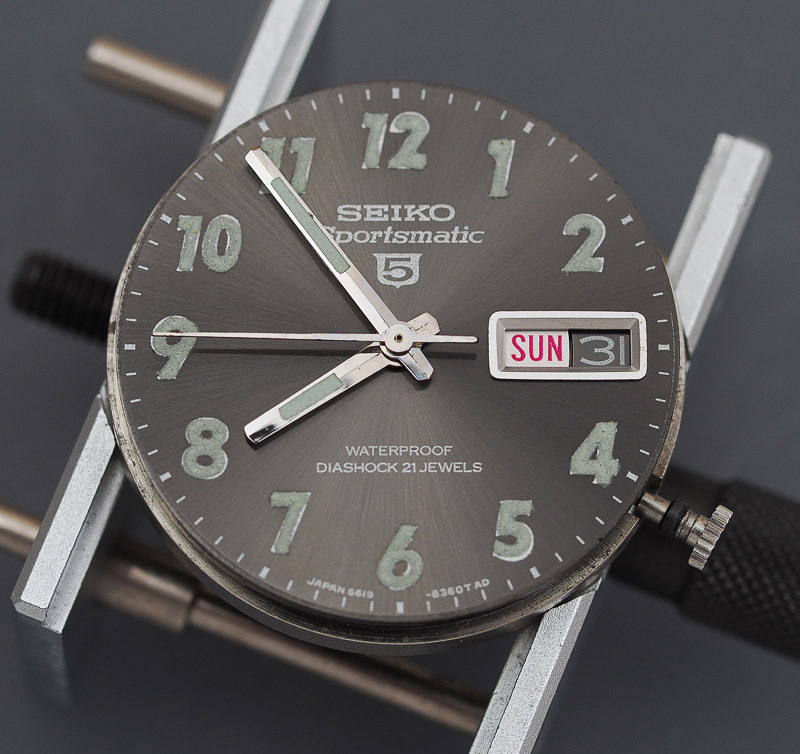 Those watches all have a common design language of dark sunburst dials with large painted luminised numerals fronting robust mainstream Seiko automatic movements featuring day/date calendar complications and fitted to generously sized waterproof steel cases with recessed crowns at the 4 o’clock position. 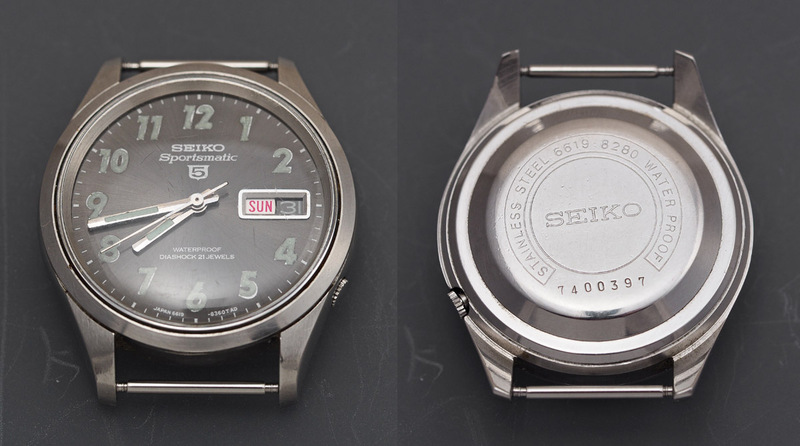 All of the members of the family of Seiko 5 watches produced to this basic design brief were made between 1966 and 1969, with the earlier watches fitted with the ubiquitous 6619 movement of the period and the later watches the 6119. This preamble sets the context in which we contemplate the subject of today’s entry: a Seiko 5 Sportsmatic 6619-8280 from April 1967. 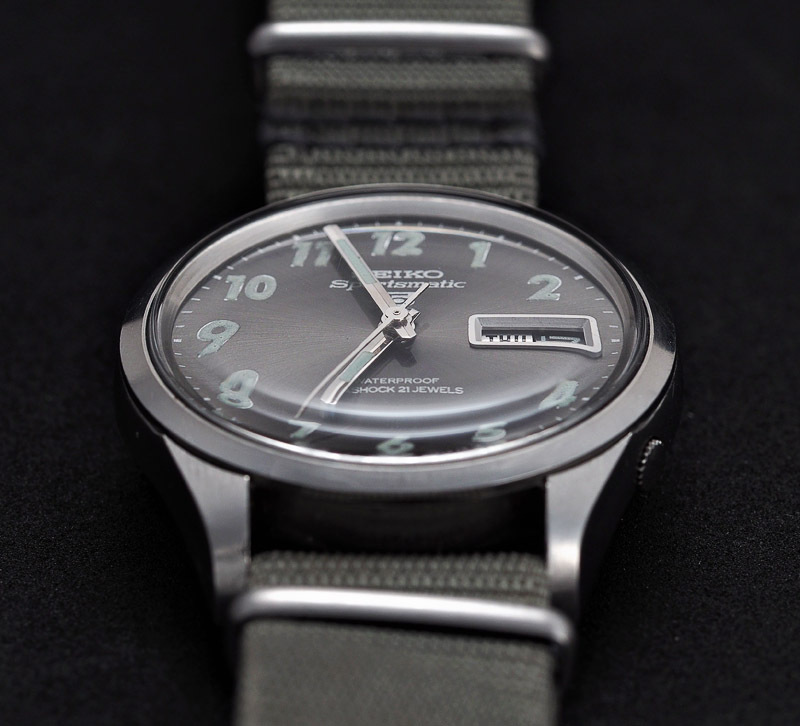 If this watch had been made in any decade other than the 1960’s it would be easy to assume that the militaristic design was a pretension but the 1960’s were a decade in which watch design was far more pragmatic, a decade where watches by and large were bought to serve a purpose rather than just project an image. It is also clear to see that this watch belongs to the same family of watches shown in the opening photograph and so we might reasonably assume that any of these watches could interchangeably have been issued through the support office supplying equipment to military personnel. This particular example is in very good condition for a watch of its age. 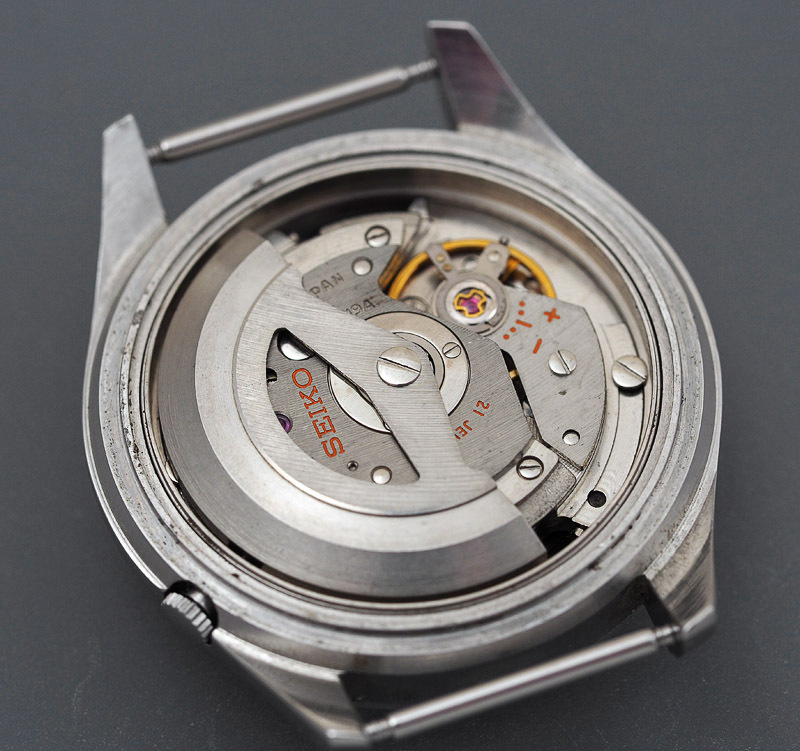 The case is very sharp, the original brushing clearly defined, the dial sporting a few minor marks but otherwise excellent, and the movement swinging easily into action. 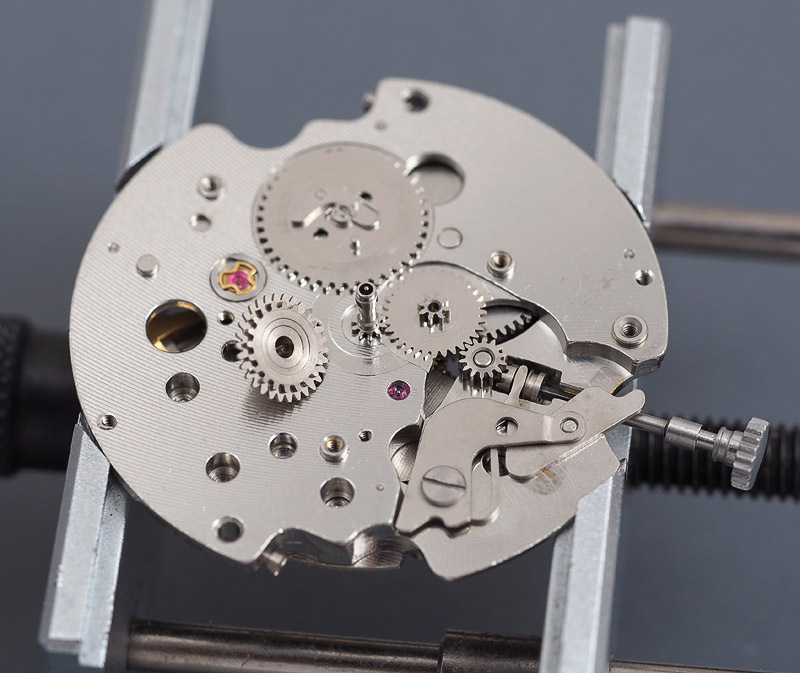 Removing the autowinding mechanism provides a view of the core movement, revealing nothing more concerning than the sort of tarnishing you might expect of a movement for which many years have passed since its last service. 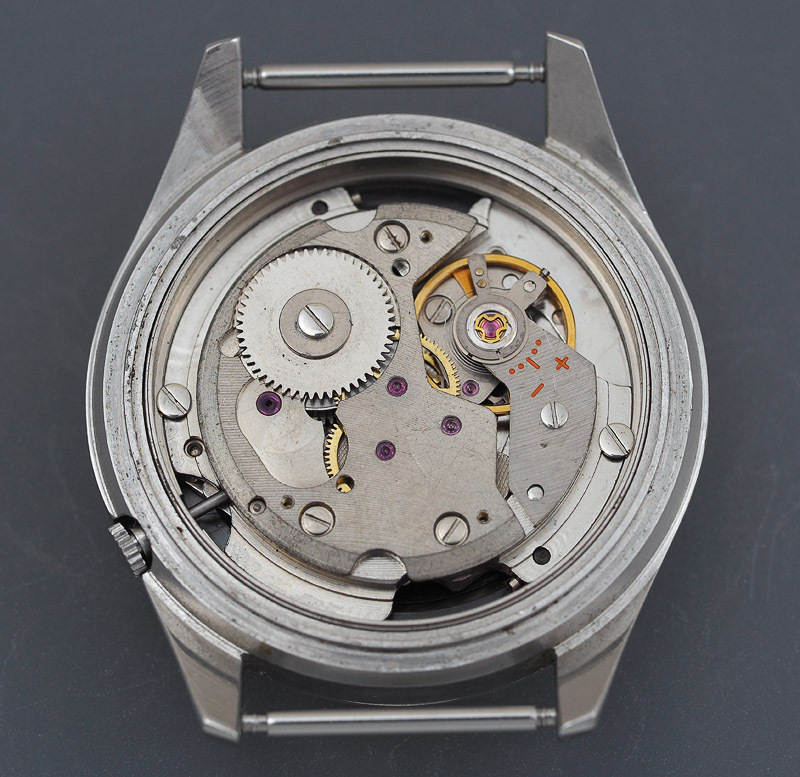 Many years ago, I bought a job lot of junk 6619 watches from the Philippines, and since then I have entertained the view that the 6619 sits comfortably at the bottom of the pile in the 1960’s Seiko watch movement hierarchy. 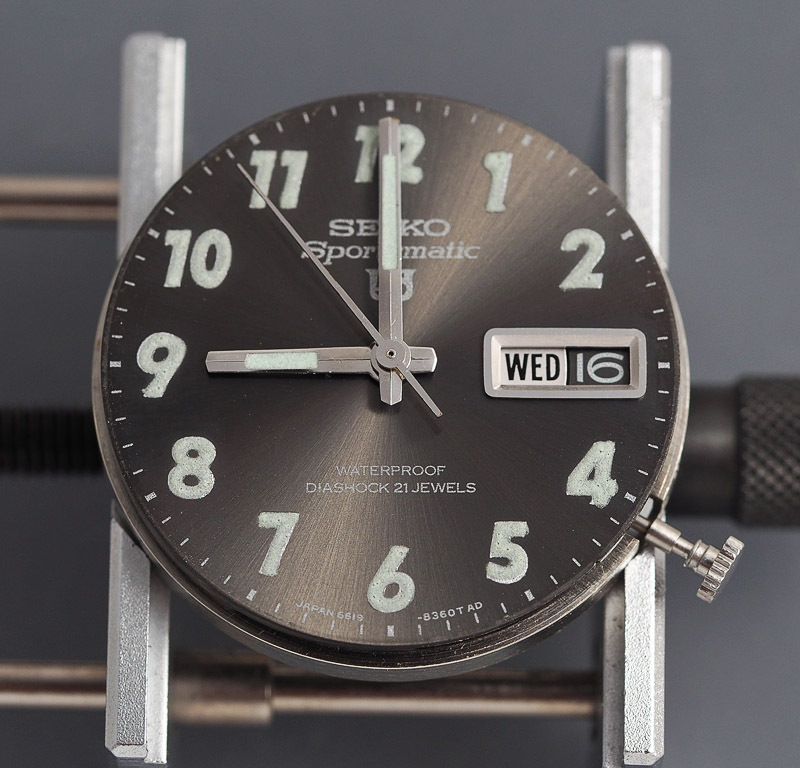 It seemed to me a movement lacking in much in the way of refinement, a workhorse fitted to lower market Seiko output. However, on the two occasions I’ve serviced 66 series movements in the past, I’ve been impressed with how well they actually perform, rather better in fact than that stalwart of the late ‘60’s and 70’s, the 6119. So let’s not persist in that snooty attitude to this working class movement, but press on and see what it has to offer. 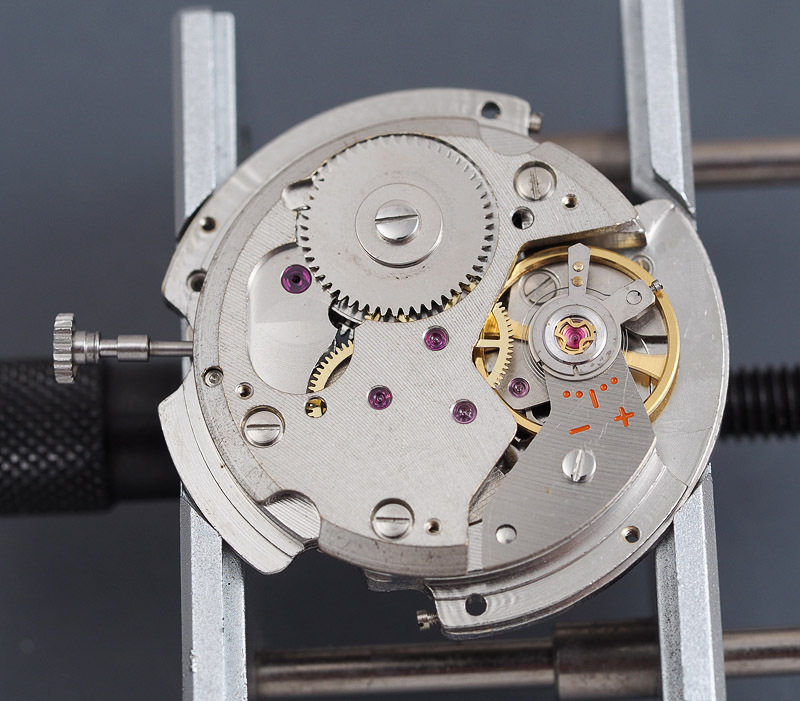 Tipping the movement out of the case provides an opportunity to take a proper look at the dial and hands. The application of the luminous material to the hour numerals is pretty crude but somehow in keeping with the military context. In fact, the lume still has some life in it, springing into action for a few seconds post exposure to bright sunlight, but no longer with the stamina to serve its original intended purpose. 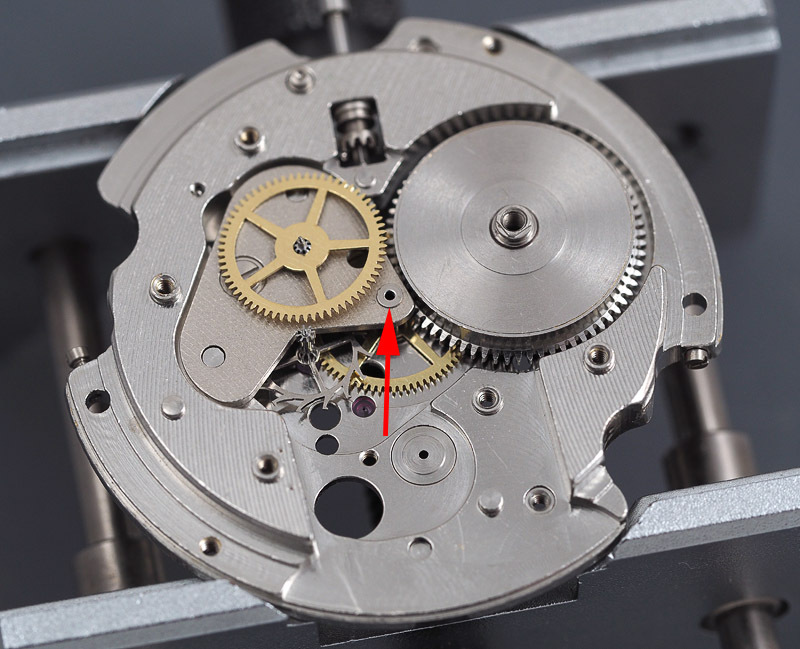 The movement at this point is suspended in its case ring and so this needs to be removed to access the screws that hold the dial feet. The two previous examples of 66 series movements we’ve met here before were variations on the 6601, a simple three hander. The 6619 adds a calendar function with both day and date, the latter quick-set. 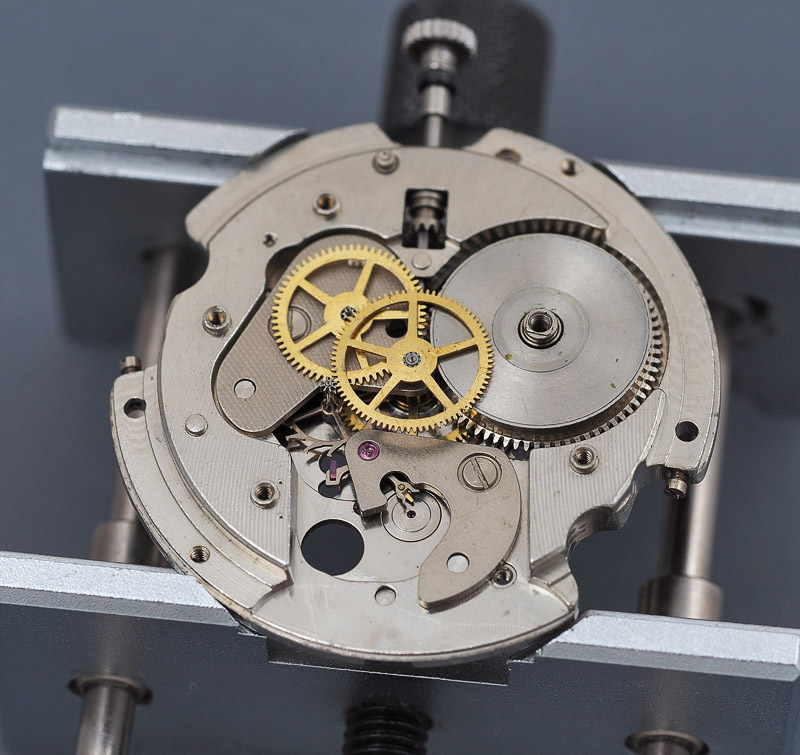 This movement is somewhat unusual in that the day function is provided through the addition of a calendar plate on which is mounted the day driving wheel and day jumper. 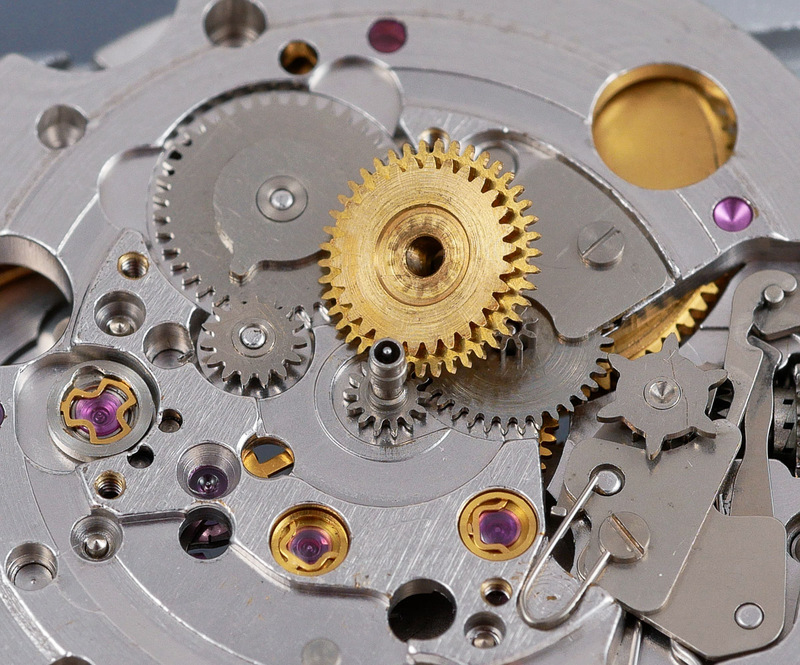 The quickset date function is operated by pushing in the crown, much like the 6119 and 6106 movements. The train wheel side of the movement threw up no surprises and as we’ve dealt with the balance side of the 66 series before, I’ll just pause to survey the gear train with barrel bridge removed. 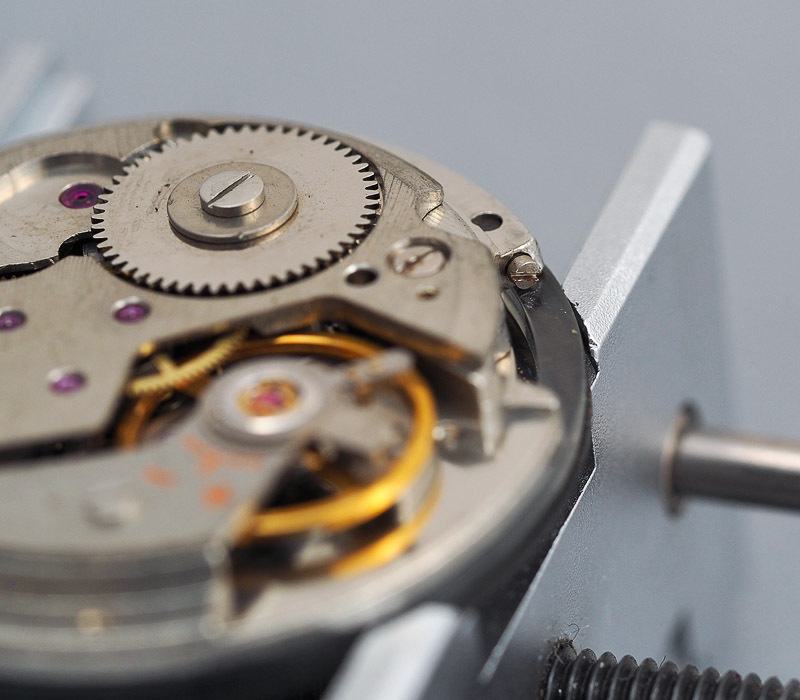 Let’s conclude our dismantling of the movement by taking a look at the mainspring. 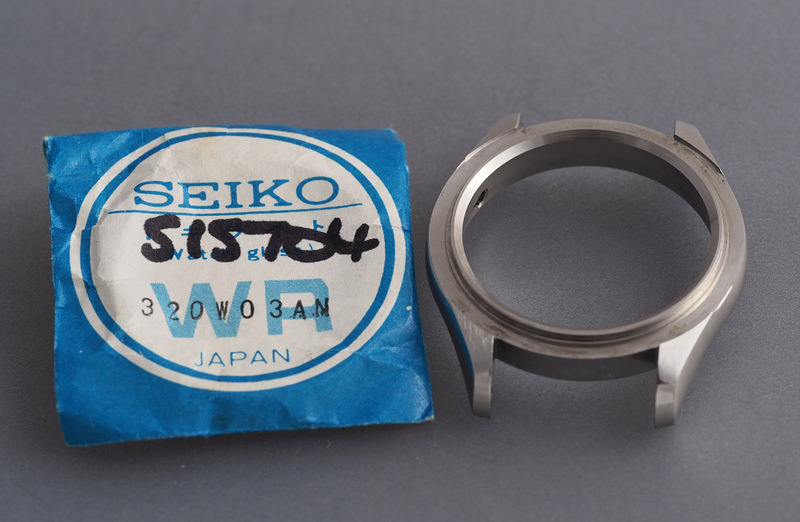 This is entirely typical of what we expect to see of a mainspring that has probably not seen the light of day since being installed at the factory: essentially dry but with plenty of molybdenum residue from the original Seiko S3 mainspring oil. 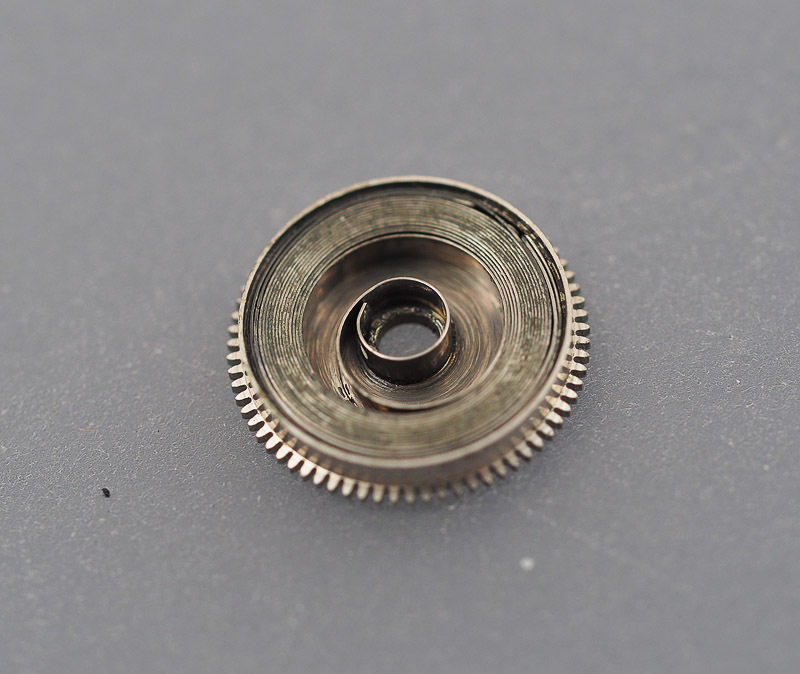 The mainspring itself was in excellent condition with no kinks and sitting perfectly flat once extracted from the barrel and so I propose to reuse it in reassembling the watch after cleaning. While we are on the subject of cleaning, some of you may wonder what my routine is these days. Well, typically I start by removing as much baked on crud as I can using sharpened pegwood, paying particular attention to bearings and jewels. The fully dissembled movement is then arranged between three tiers of baskets that then fit into the watch cleaning machine frame. The smaller parts are placed into individual mini baskets that sit on one or more of the three tiers. I will also have pre-cleaned the mainspring barrel in lighter fluid to remove any traces of molybdenum grease before placing that in one of the baskets. The mainspring itself I keep back and will clean by hand later on in the process. The whole assembly then goes into a glass jar filled with L&R ammoniated watch cleaning solution for a 15 minute session in the ultrasonic bath. 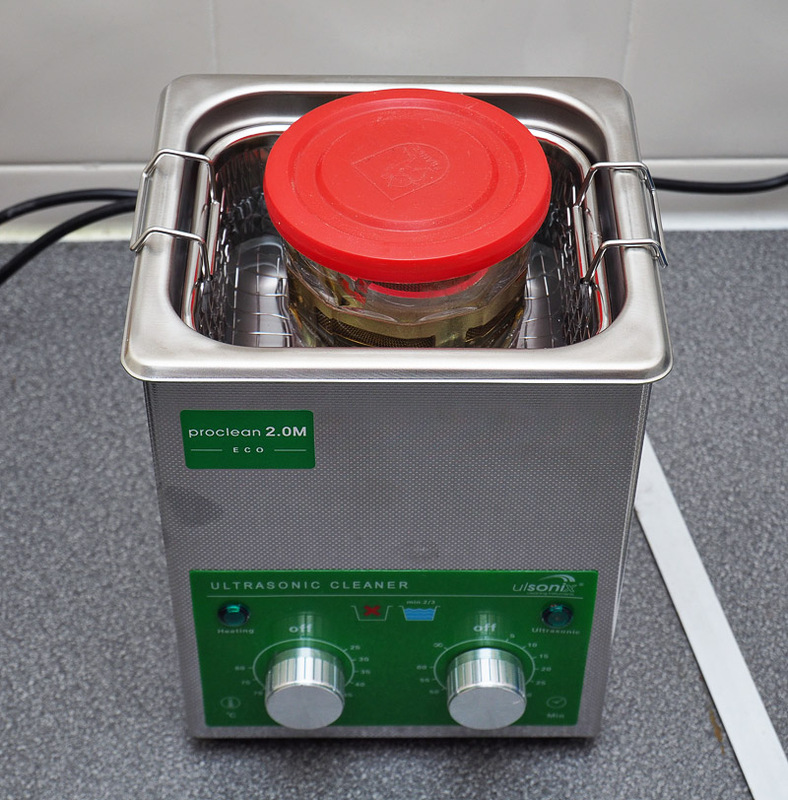 Those of you who read the post on restoring bonded frame crystals a couple of posts back may notice that this is not the same ultrasonic bath as the one used for that exercise. The reason for that is that the extended high temperature regimen required to detach the crystals from their frames killed my impressive-looking but apparently somewhat fragile ultrasonic bath. I am optimistic that my new purchase, made in Poland incidentally, will prove somewhat more robust. It certainly appears to be an extremely effective instrument so far. 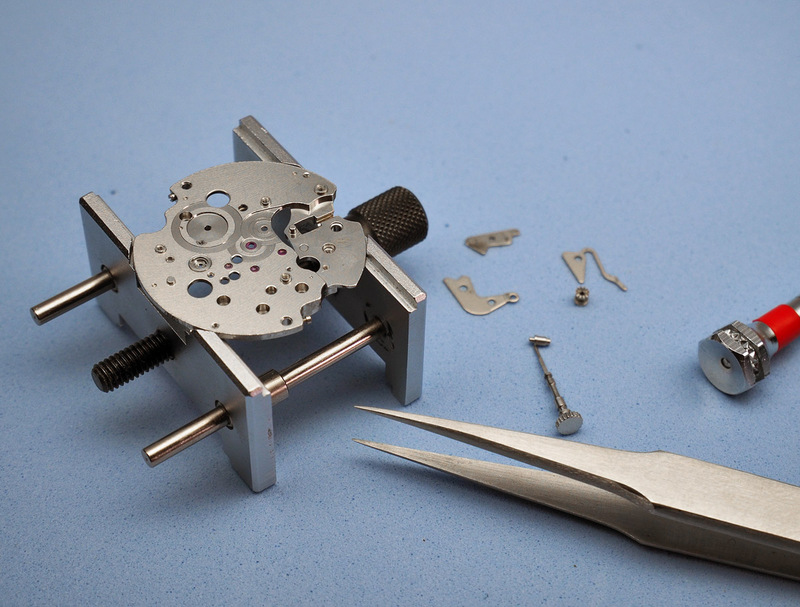 Having completed the ultrasonic cycle, I lift the frame with baskets out of the solution, drain, dry off with some kitchen roll and fit to the rotor shaft of my watch cleaning machine (an Indian-made clone of the Elma Super Elite). This machine has three cleaning chambers plus one drying chamber. The first cleaning chamber houses a jar of L&R cleaning solution and so that is where we visit first. 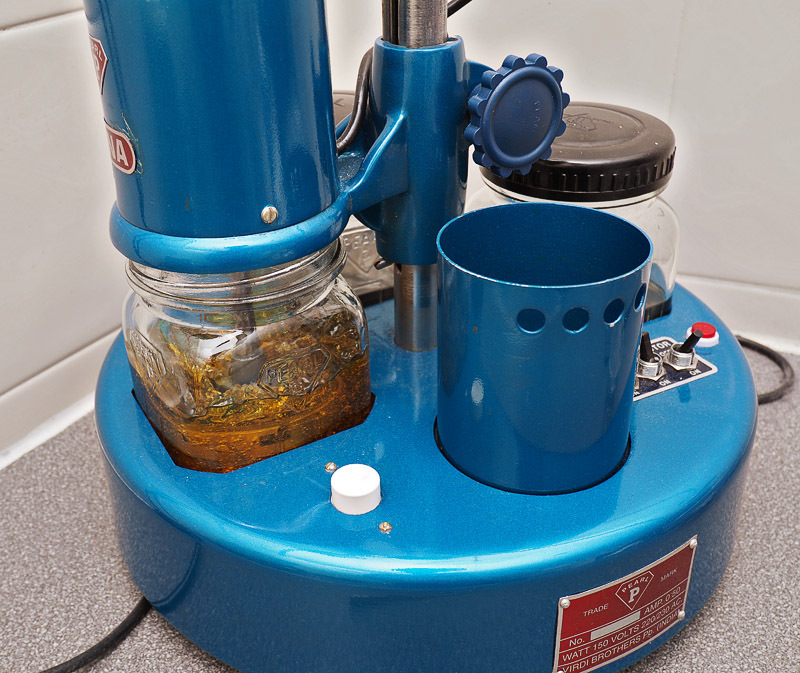 The frame is lowered into the jar, tightened into position and the motor started up at its lowest speed setting. I try to keep the speed of rotation low to keep the solution moving at a decent rate without introducing too many bubbles. After 15 minutes in the cleaner, I switch off the motor, lift the frame above the level of the liquid, and then switch the motor back on for 30 to 60 seconds to spin off as much of the cleaning fluid as possible. With this done, the assembly is released and rotated 90 degrees where it is lowered into the first of two rinsing chambers, both of which containing L&R rinsing solution. 10 minutes in the first and 10 in the second, with spin offs between each step. I will also have switched on the heating element in the drying chamber at the point that I lower the frame into the first of the two rinsing chambers so that it is up to temperature by the time the rinsing is complete. Before lowering the cleaned parts into the drying chamber, I will remove the pallet fork to avoid potentially damaging the shellac that secures the stones. The heating stage is one I tend to be the most nervous about. I’ll let the frame spin for a few minutes in the hot chamber but then switch off the heater, raise the frame a bit and let the parts dry on the updraft of hot air from the now cooling heater. By the time I get the parts back to my desk, they are completely dry. At this point then, we are ready to begin reassembling the jigsaw. The proclamation on the dial that this is a 21 jewel movement suggests that one or more Diafix settings might lurk within but that proclamation flatters to deceive. 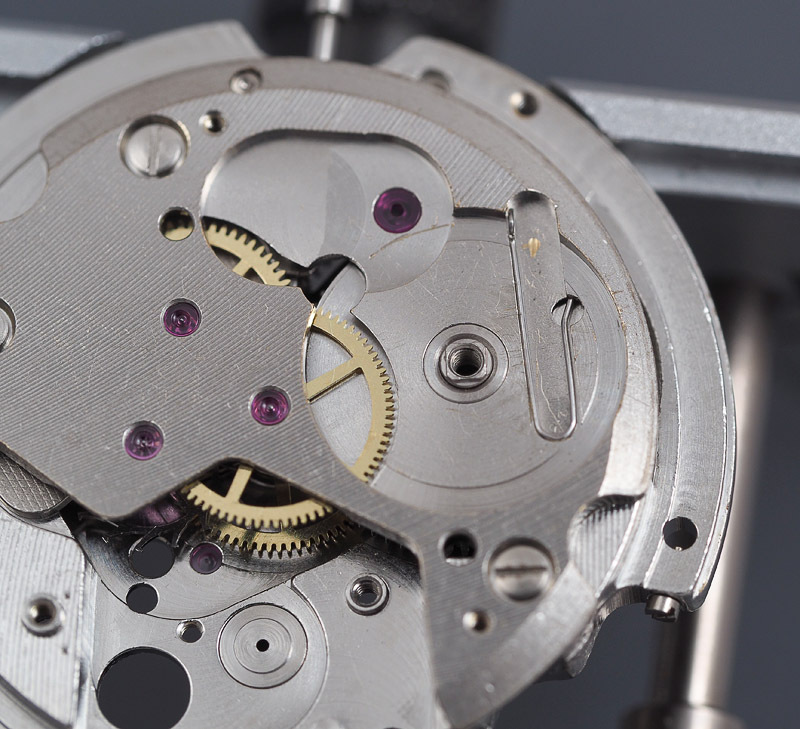 If you’ve been paying attention, you will have noticed that there are three dummy jewels located on the date dial guard and so in reality this is a movement with 18 functional jewels. 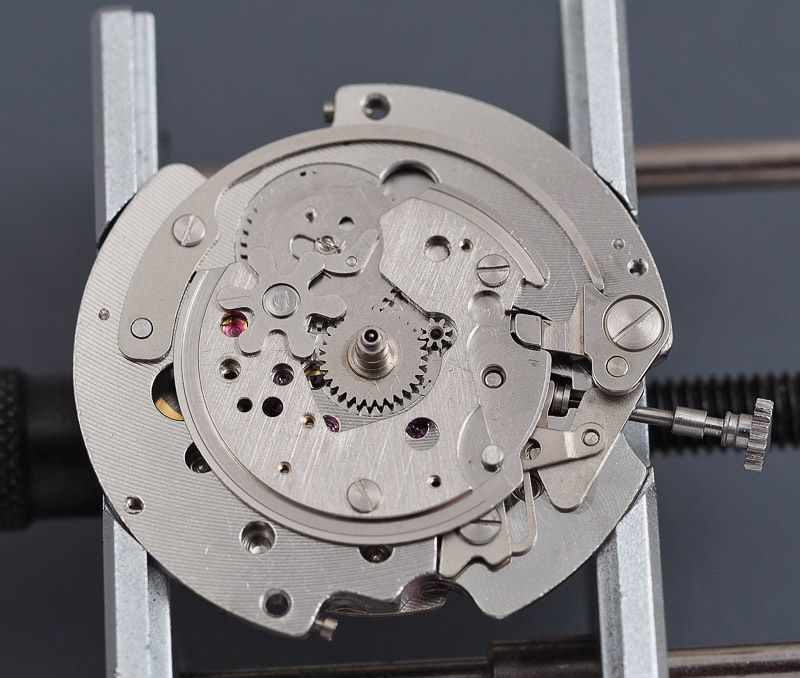 The additional jewel over the 17 jewel 6601 derives from the jeweled bearing serving the sweep seconds wheel in the barrel bridge. In the absence of any Diafix settings, the process of piecing this one back together is entirely routine. We begin with the keyless works, centre wheel, its bridge and the cannon pinion. Before proceeding any further, we have to reunite the mainspring with its barrel. The mainspring sits within its barrel with its spiral winding inwards in a clockwise direction which requires a left-handed winder and drum. 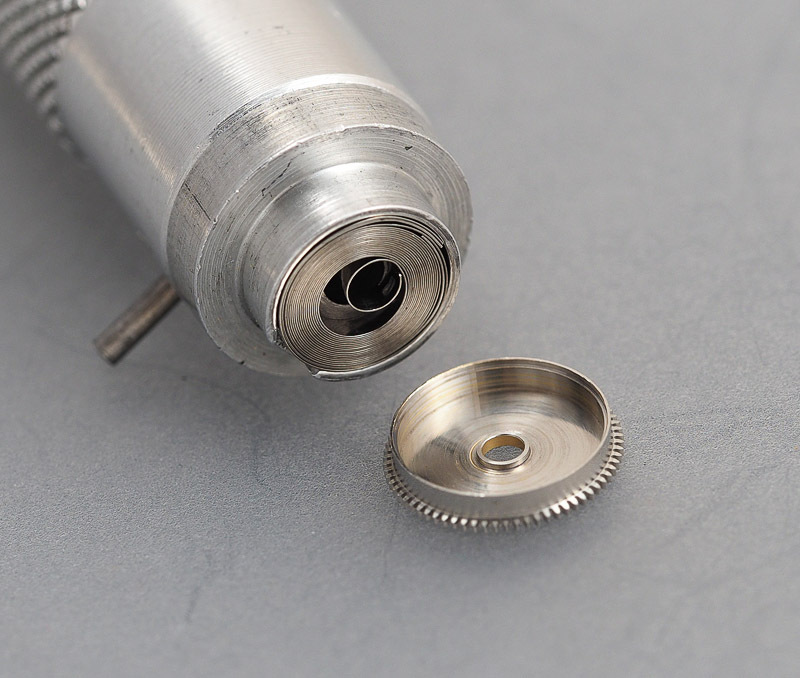 However, I have none such and so I have to wind the mainspring into the drum in the opposite direction to what its design intends, hoping that the tab on the shaft will find purchase. Fortunately it does and so this exercise passes without drama. 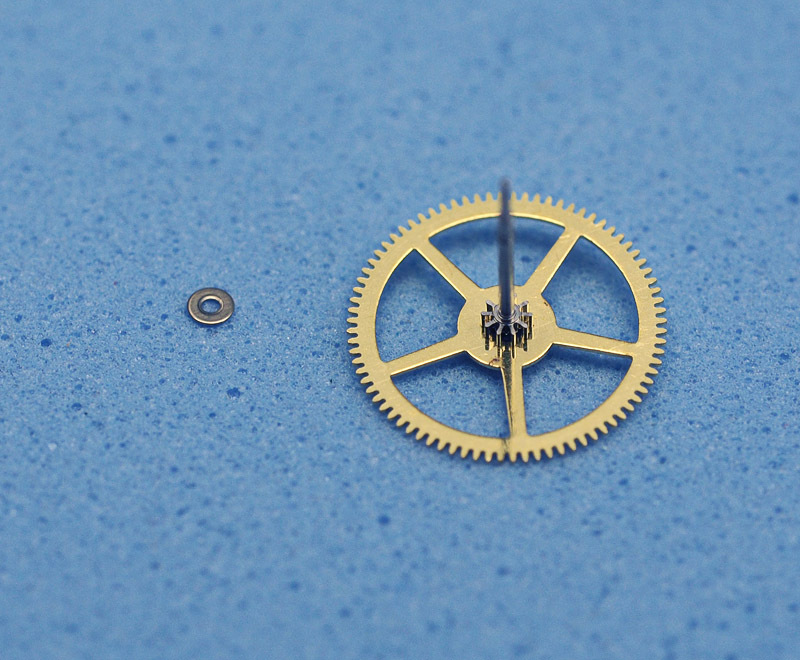 The sweep seconds wheel sits on a tiny washer which Seiko call a bearing plate in their technical guide for this movement. It is something of a mystery to me that this very small part has not absented itself in the 51 years since it was originally installed but nevertheless, there it is. The washer needs to be positioned over the hole in the centre wheel bridge before locating the sweep seconds wheel. The train wheels and bridge locate happily and a puff of air suggests that everything runs freely. The click spring needs to be located next before fitting the ratchet wheel. With the pallet fork, bridge, Diashocks and balance refitted, I can wind in some power and take a provisional sampling of the health of the movement. The amplitude is excellent, pushing 300 degrees, but the beat error is biblically out of whack at 10 msec. Some iterative juggling of the positions of the stud and regulator quickly get the beat error down to 0.1 ms with the resulting timing curve then adopting a gratifyingly flat gradient. I’ll do a more careful regulation later but for the moment I am very happy with the numbers. Turning our attention to the calendar side, we can note the design of the hour wheel with its double-decker arrangement of gears, the lower of which connects to the day date driving wheel and the upper of which to the upper pinion mounted on the minute wheel. 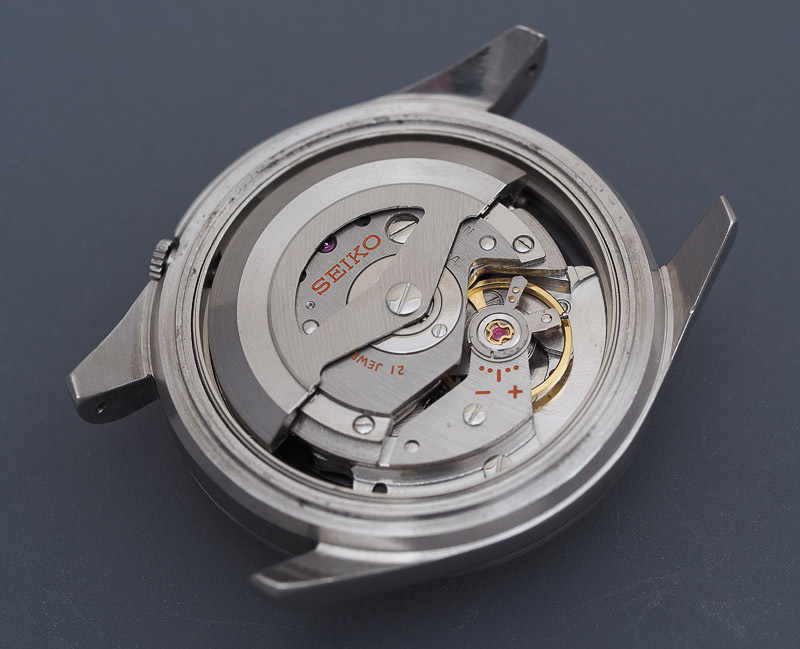 We’ve seen this design before in the Grand Seiko 5722 but in that case the connection to the date driving wheel was via an intermediate wheel. 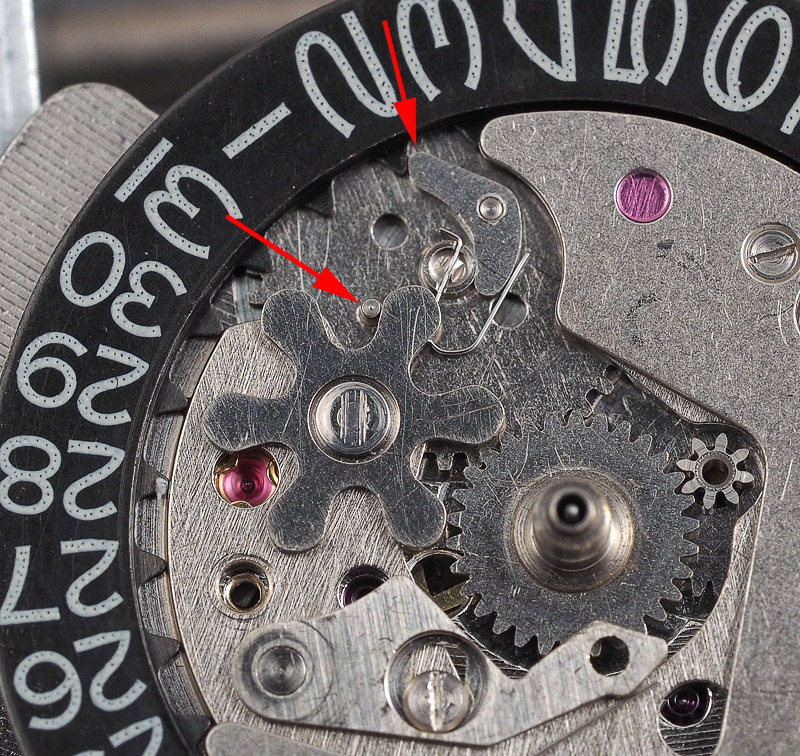 The day complication in this movement is operated by a day driving wheel mounted on a separate calendar plate. During the date transfer period between 10pm and 1am, the date finger mounted on the day date driving wheel impacts upon one of the teeth on the inside of the date dial. Simultaneously, a post on the day date driving wheel impacts upon one of the arms of the day driving wheel which in turn drives the day star mounted on the rear of the day disk. 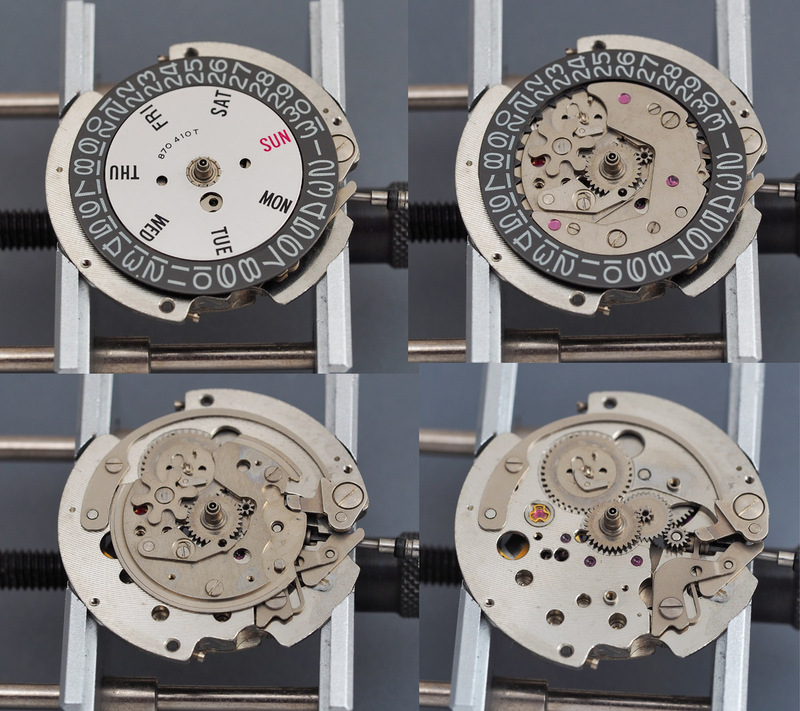 Having completed the assembly of the calendar parts and tested their operation, including the date quickset, we can refit the dial, hands and case ring. We are more or less ready now to refit the movement to the case, but first we have to ready the case. 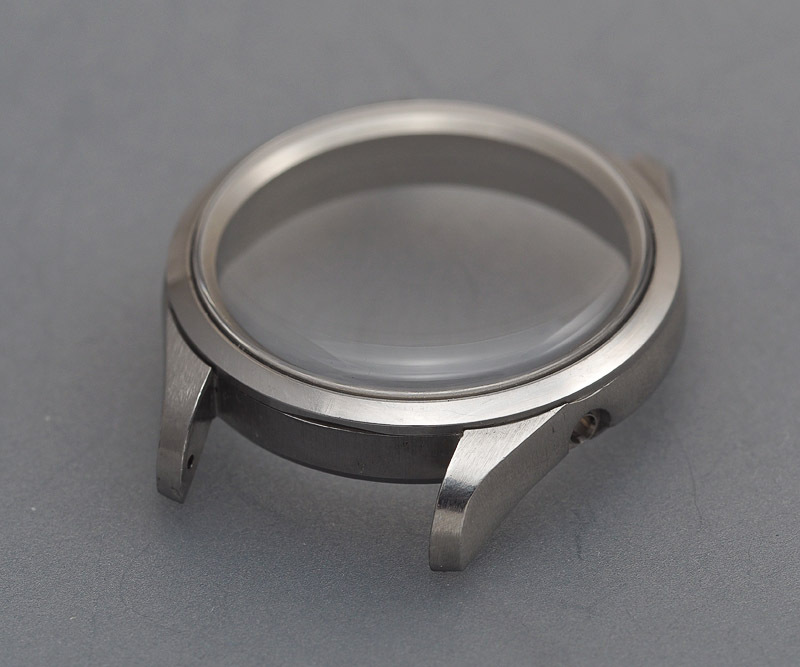 We start by prising off the bezel which provides access to the crystal. You’ll notice that the crystal is of the type that sits around the outside of the dial aperture lip on the case, and the waterproof seal is then achieved as a result of the external force exerted by the bezel. The case did not need any attention other than a proper clean and so we can jump straight to the point of selecting the correct replacement crystal, a 320W03AN. Although this is the correct part, I was not able to refit the bezel without first slightly reducing the external diameter of the crystal. All that is left is to fit a fresh gasket to the crown, fit the movement and then refit the autowinding mechanism and rotor. In surveying the end result, and in spite of suggestions to the contrary made at the start of this post, it is difficult to conclude that this has been a story about anything other than a military watch. 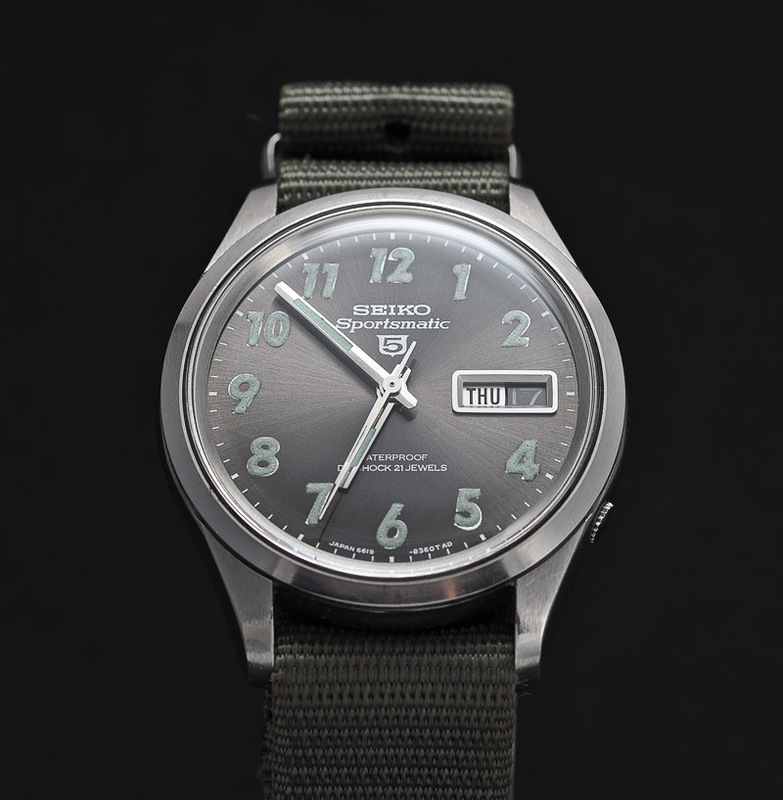 There is no ‘beyond reasonable doubt’ that this particular model was ever used in Vietnam but in being so obviously a member of the series of military style Seiko 5’s that were produced in the 1960’s, some of which were demonstrably used for that purpose, we can probably give it the benefit of the doubt. Somewhat unfittingly, we conclude with a shot of the watch strapped to the puny wrist of a middle aged chemical physicist who dabbles occasionally in the black ops of horology. Very nice…..blimy those case sides are good enough to shave with..! !….allways interesting how some dials survive and others dont…..top work as usual..!! Thanks! Some watches get used more than others and some owners are more careful than others. I suspect this is a watch that has not been a regular daily wearer in the past. Nice work, and that is a good-looking movement. Thanks for the warning about the tiny bearing plate. Unfortunately, even forewarned, I let mine escape, never to be recovered. Oh well. I’ve managed to locate a junk movement for spares so I’ll just have to learn from my mistakes. Thanks for this very helpful series of articles and kudos for your amazing macro photography skills. Many thanks – I’m glad you’ve found the article useful. As you observe, the key is to view mistakes as learning exercises! No, those are the case screws. The dial screws hold the dial feet.